News: British firm Feilden Clegg Bradley Studios has unveiled plans to slot a glazed extension over the brutalist concrete architecture of Southbank Centre in London. The new glass volumes form part of £120m facelift intended to bring the Southbank Centre, which was originally built for the Festival of Britain in 1951, up to the standard of the refurbished Royal Festival Hall, completed in 2007. As the focal point of the proposals by Feilden Clegg Bradley – a firm that was part of the team behind the 2008 Stirling Prize-winning Accordia housing development in Cambridge – the atrium is designed to be used as a rehearsal and performance space for an orchestra of 150 and choir of up to 250. The architects also intend to refurbish existing buildings and create additional arts spaces, including a building alongside Waterloo Bridge for educational activities. From 7 March, the proposals will be shared in a public exhibition in the Royal Festival Hall and on the Southbank Centre’s website. A planning application will be submitted to Lambeth Council in late spring. Last year architects Softroom built a temporary Mexican restaurant outside the Southbank Centre, while David Kohn Architects and artist Fiona Banner installed a boat on the roof of the Queen Elizabeth Hall. Images are by Feilden Clegg Bradley Studios. Southbank Centre has today (6 March) unveiled its proposals to transform the Festival Wing – the Queen Elizabeth Hall, Purcell Room and Hayward Gallery complex – to create, together with the successful Royal Festival Hall refurbishment, a world-class cultural centre for the 21st century, providing more art for more people in better spaces. The proposals, by architects Feilden Clegg Bradley Studios, include the refurbishment and renewal of the existing 1960s buildings and the creation of major new arts spaces including a new glass pavilion, a new central foyer and a new liner building. 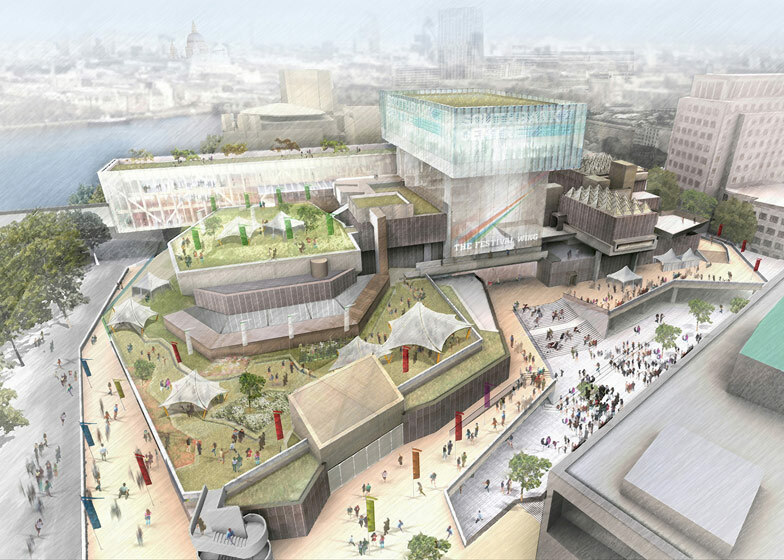 The proposals will enable Southbank Centre to realise its vision to deliver a larger and more ambitious arts, educational and cultural programme across the site for all its visitors to enjoy. The project will bring the performance spaces and galleries up to the standard of the transformed Royal Festival Hall, completed in 2007, and address current urgent problems including poor access, worn out services and the need to upgrade stages, galleries and back stage areas. In addition, Southbank Centre will build on its heritage from the Festival of Britain in 1951 and its successful festival programme to make the most of these buildings and transform this part of the site to create new cultural experiences for future generations. Queen Elizabeth Hall – refurbishing the auditorium; expanding the width of the stage to create wing space with less impact on sightlines; upgrading artistic and technical facilities; refurbishing back of house; improving disability access; and providing access from the new Central Foyer. Purcell Room – refurbishing the auditorium and back of house facilities including improved stage access; upgrading technical facilities; improving disability access and creating a new entrance with access from the new Central Foyer. Hayward Gallery – refurbishing the galleries and improving access through the galleries, to enable a broader exhibition programme, including free shows, which will be open for more weeks during the year. The iconic pyramid roof will be replicated to improve lighting and be made watertight. Back of house improvements include a secure loading bay. Access from the new Central Foyer. New Central Foyer – a glazed atrium will cover the space between the Queen Elizabeth Hall and Purcell Room, and the Hayward Gallery, to create an artistic and social hub for this part of the site with new entrances to all three venues and BFI Southbank, and improve links to the National Theatre. Glass Pavilion – a new world-class venue ‘floating’ on top of the Central Foyer. This flexible, flat floor space, with first-class acoustics, is designed to hold a full orchestra of 150 and choir of up to 250 plus small audience. The scale will attract the greatest orchestras and performers across the art forms to rehearse and perform in this new space. It will also be able to host national and international corporate events. A new ‘liner’ building (along Waterloo Bridge) – bringing together educational, artistic and commercial uses, this large, flexible space will host a broad, year-round education programme for all age groups and abilities. The Saison Poetry Library will move from Level 5 in the Royal Festival Hall to join a literature and spoken word space in a new national literature centre, and two new restaurants will overlook the river. new Heritage and Archive Space – which will enable visitors and the local community to explore the site’s rich history in a welcoming and hands-on environment. A new place for Children and Families – which will provide year-round activities such as storytelling and making things as well as exhibitions and a family restaurant. It will also be the new home for the childrens’ collection of the Poetry Library. Green spaces and new places – creating external public spaces including a new square for public performance and two more roof gardens, with incredible views over London. New connections – sweeping steps drawing people from the Royal Festival Hall and the new public square up to the Festival Wing, leading through the Central Foyer to Waterloo Bridge. Access to the site will be easier for pedestrians and wheelchair users via two new entrances from Waterloo Bridge. Servicing will be moved to create more space for public use and a more attractive route to the river. A new riverside area for urban arts – which is visible to the public from Queen’s Walk, will be created with urban artists including skateboarders, BMX riders and graffiti artists. Cafés and restaurants – will enhance the cultural experience; add to the range of choice along the South Bank; and provide much-needed capacity to meet increasing demand across the site as the South Bank becomes an ever more popular destination for Londoners and visitors to the capital. From Thursday 7 March, the proposals will be shared in a public exhibition in the Royal Festival Hall and the exhibition will also be available online at Southbank Centre’s website. The physical and online exhibition forms a key part of the public consultation of this project ahead of a planning application being submitted to Lambeth Council in late Spring. The exhibition will be open daily from 10am to 11pm and it will be updated as the plans develop through consultation.